Quick-open structure will be adopted in it, the upper bed can be moved easily and it is convenient for cleaning. The bed board was made with laser punching technology, it effectively avoid deformation by common punching technology. The lower bed is supported by stainless steel seamless tube. It's more strong. Â Raw material is heated evenly and heat exchange is fully used and dry capacity is high. Compared with ordinary dryer ,the energy can be saved about 30%. The fluidized state is stable and no dead angle and phenomenon of broken out. It is good in regulation and wide in suitability. The thickness and moving speed in the machine and the amplitude change speed of the material can be steeples regulated. It is small for damaging the surface of raw material. The machine can be used for drying materials that are easy broken. The drying effect can not be affected even materials gave anomalous shape. It is effective to prevent from cross pollution between raw material and air because the equipment adopts fully closed structure. So that keeps the environment clean. Â Raw material is fed into the machine from the inlet and moves forward continuously along with the level of fluidized-bed under the action of vibration. 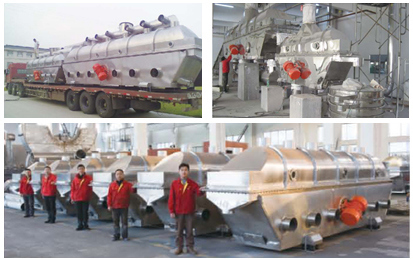 The hot air passes through fluidized-bed and carries out heat exchanging with damp raw material. Then the damp air is exhausted out through cyclone separator and duster, and the dry raw material is discharged through discharge outlet. 1. Pharmaceutical and chemical industries: all kinds of press tablet and granule, boric acid, borax, dihydroxybenzene, malic acid, maleic acid and so on. 2. Foodstuff and construction material industries: distiller's grains, monosodium, edible sugar, edible salt, mine residue, bean, seeds and so on. 1.Q:DoÂ youÂ Â haveÂ factories? A:Yes,weÂ haveÂ factoriesÂ inÂ ChangzhouÂ CityÂ onÂ dryingÂ machine. 2.Q:HowÂ isÂ theÂ progressÂ forÂ Â anÂ newÂ order? A:1)Â weÂ willÂ provideÂ pre-saleÂ service,Â itÂ isÂ free.JustÂ contactÂ usÂ ,andÂ tellÂ usÂ whatÂ youÂ wantÂ toÂ dry,Â andÂ capacityÂ youÂ needÂ andÂ someÂ necessaryÂ Â conditions,Â ourÂ salesÂ andÂ technicalÂ peopleÂ willÂ giveÂ theÂ bestÂ suggestionÂ forÂ you. 2)Â OnceÂ youÂ haveÂ confirm,orÂ ifÂ youÂ like,Â welcomeÂ toÂ visitÂ ourÂ factories.YouÂ canÂ signÂ theÂ contactÂ withÂ us,Â andÂ payÂ deposit. 3)AfterÂ deposit,Â weÂ willÂ sendÂ youÂ theÂ drawingÂ ofÂ eachÂ part,Â andÂ confirmÂ withÂ you.IfÂ okay,Â weÂ beginÂ producing. 4)WhenÂ completed,Â weÂ willÂ sendÂ theÂ pictureÂ orÂ videoÂ toÂ youÂ forÂ confirmation.OrÂ youÂ canÂ comeÂ Â toÂ check.IfÂ allÂ okay,paymentÂ ofÂ balanceÂ willÂ beÂ needed. 5)WeÂ sendÂ theÂ machineÂ andÂ youÂ willÂ getÂ theÂ machineÂ soon.